Chart No. 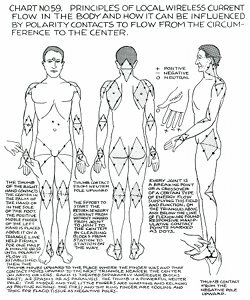 59 - Principles of Local Wireless Current Flow in the Body and How It Can Be Influenced by Polarity Contacts to Flow from the Circumference to the Center. The thumb of the right hand contacts the center in the palm of the hand or in the sole of the foot. The positive middle finger of the left hand is placed above it on a triangle line held firmly for one half a minute or so until polarity flow is established. 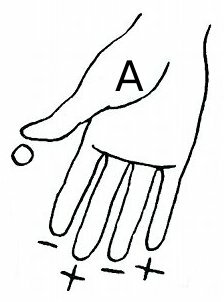 Then the thumb moves upward to the place where the finger was and that contact moves upward to the next triangle nearer the center on arms or legs. Each is treated separately wherever blocks exist; as spasms or as paralysis. The thumb is a powerful neuter [neutral] pole; the middle and the little fingers are warming and relaxing as positive actions. The first and the ring finger are cooling and tonic for flacid [flaccid] tissue as negative poles. The effort to start the return sensory current from without inward from joint to joint to the center by clearing blocks from station to station on the way. Every joint is a breaking point or a crossover of a certain type of energy flow supplying this field and function. 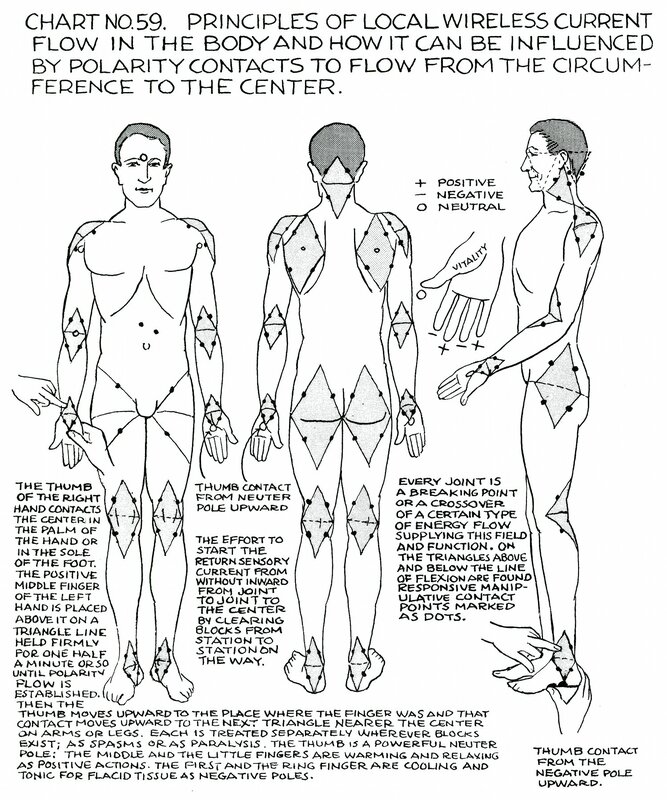 On the triangles above and below the line of flexion are found responsive manipulative contact points marked as dots. (A) Thumb contact from the negative pole upward.